In this guide I will try and help those of you that want to get started with FPV (First Person View) but don’t know where to start or what to buy. I will try to teach you what to look for and what to look out for when choosing your first components. The guide is segmented into two parts “The basic FPV setup” and the “The “advanced” stuff”. The first part being more in depths, giving basic understanding, and the second part is more of a “carrot” showing ways to enhancing the FPV experience once you got going. FPV flying isn’t quite as easy to do as one might think – “It is like learning to fly radio control all over again”. Do not attempt to fly full FPV the first few flights! It’s best to either fly your plane normally (visually) with the FPV gear on it and record the flight so that you afterwards can watch the recording and get used to the FPV point of view, or have a friend fly your plane while you watch the video feed. The important thing is to get used to navigate from the air, which is quite a lot harder than it sounds. A good tip is to before the flight, spot out big landmarks that are easy to see from the air and remember how they are located in relations to your self. You do not want to get disoriented in the air, that will most definitely lead to a crashed or lost airplane. A friend that can visually follow the airplane for you (a “spotter”) and take over if you get disorientated or the video gear malfunctions is a good idea. Take it slow, don’t rush things. It’s easy to loose a FPV airplane. If you got that were good to go! There are many different airplanes out there that are good for FPV flying, and different people like different airplanes, If I had to recommend an airplane it would be the Multiplex Easy Star. It fulfills all points on the checklist above with ease, it can also take extremely much abuse and it can be modified a lot and still fly great. For these reasons it’s by far the most used FPV plane out there. The Easy Star is also the perfect first airplane for those of you that can’t fly RC yet. This is the BASIC setup, the absolute necessary stuff to be able to fly FPV. I recommend to start out simple and then expand with the more advanced stuff once you mastered the basics. At the moment there are 4 different frequency bands to choose from when it comes to transmitting video, and they are; 900MHz, 1.3GHz, 2.4GHz and 5.8GHz. Before you choose what frequency you want to use you need to do some research of what frequencies that are allowed in your country, for example; 900MHz is not allowed in Sweden because it’s used by air traffic, and if any license is needed to transmit on any of these frequencies. In most countries you are allowed to transmit up to 10mW of video on the 2.4GHz band without a license. You also need to take into account what frequency your RC transmitter utilizes; if you fly on 2.4GHz, you can’t use that frequency for your video link as well. Ok, now that you’ve chosen the frequency you need to know how much power to get. “There is no such thing as to much power” – Or is there? A common misconception is that doubling the transmitter power will give you double the range. This is not true, doubling the transmitter power will only give you 1.414 times longer range (The square root of 2 or 3dB). The best choise in my oppinion is to use a smaller transmitter and a patch antenna (more about antennas later on) on the receiver to get extra range as you normally won’t fly 360° around yourself. These combos easily gives about 2-4km of crisp video which is more that you need if you fly with a common RC link. They will also be light, use less current and not be prone to overheating. A good balance for your first setup. This is the easy part. When you buy a transmitter you will almost definitely be able to buy a matching receiver from the same place. As long as the receiver works on the same sub frequencies (ex 910MHz, 915MHz..) as your transmitter your good to go. Sometimes you will have the choice to buy a “dual output” receiver, which means that is has two composite outputs, which is nice if you want to record you flights or have a “passenger” screen/goggles. But you can get a separate composite “splitter” later on if you want to. Any camera that has a composite output will work but there are some qualities to look for in a camera when picking one for FPV use. The most important one is fast brightness adjustment, this is because the brightness varies so much and so fast during a normal FPV flight. If you use a camera that’s slow to adjust its brightness you will end up with a useless picture during nearly the entire flight, and you might even crash. Other qualities to look for is obviously small and lightweight. But now comes the tricky bit… Image quality. Why is this the tricky bit? Because “beauty is in the eye of the beholder”. Different people value different things when it comes to “image quality”. Most cameras that can be found in FPV shops are relabeled security cameras, f.ex the real name of the KX-171 camera I’ve used is “480 tvl 0.2 lux, 1/3″ SONY® super-HAD® CCD, 12VDC”. Now that you’ve chose the video transmitter and camera you need something to display the image you’re transmitting. The cheapest alternative is to get a small TFT display, like 7”, and mount it inside of a box to block out sunlight, a so called “Geek box”. It’s cheap but isn’t very practical (nor good looking). Just be sure the screen has at least 640*480 pixels of resolution. An other alternative is to buy your self a pair of video-goggles. They are much more practical and in my opinion give a much better experience when FPV flying. When choosing video-goggles I recommend a pair with at least 640*480 pixels resolution. Any lower and the experience will suffer greatly as it will “smudge” out the picture, destroying the details. Another figure to look out for is the FOV (Field Of View) angle number. This number tells you how big you will experience that the picture is. A higher value is better. When this is written the goggles with the best FOV is the Fatshark RCV922 with 46°. Not all manufacturers print this number, but some does gives a size of a “virtual” display experienced at 1 meters distance, usually 58” or something similar. Also in this case the higher value is better. Other than that it’s not much to look out for when choosing goggles. If you get a chance to test the goggles on before you buy them, take it. Try them on and make sure they feel “right”. You now have what you need to do your first FPV flight. The next segment will cover the more “advanced” stuff that you might want to get further down the road. I will not be as “indepth” about these topics thou, but rather give you a simple taste of what they are. Even if it isn’t needed to fly FPV I strongly recommend getting yourself a recorder to be able to revisit your flights. This will help a great deal when learning to fly from the airplanes perspective. I can also recommend getting a patch antenna from the start, they are a cheap way to increase your range at the cost of 360° reception. But how often do sit in the middle of the field and fly around yourself? All these work well and are not that hard to come by. I’ve been using a Sandisk V-Mate, which is a DVR that records onto a SD-card. It’s not great, but it works. I recommend getting something better. Search the net and find out what’s the best for you. Here is a very good list with recorders that work well for FPV use. patch antenna on the receiver since I started with FPV and I have never felt limited by it, but to each his own. I can recommend reading my guide “A simple explanation of antenna gain” which will give you a greater understanding of antennas. To further enhance the FPV experience I can recommend building or buying a pan/tilt system. It’s just two servos that either pans (making the camera look right/left) or tilts (camera looking down/up) the camera. You don’t need to get both at once. You can start out with just the panning as this is the most rewarding axis. You can control the pan servo with channel 4 if you’re using a 3 channel airplane like the Easy Star, and simply control the panning with the rudder stick. Or you could hack the cannel 5 and 6 switches with pots. Or you can buy a headtracker. There are many solutions. 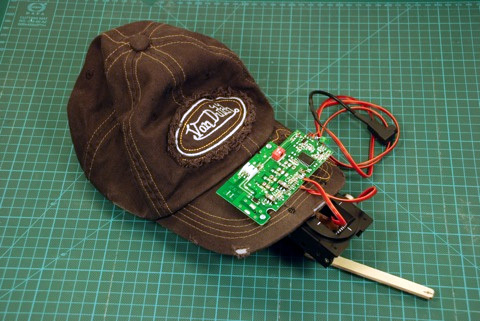 My DIY headtracker, the Hat-Tracker. Short for On Screen Display. What it does is that it superimposes text/graphics onto the picture giving you real time information from the airplane. I can recommend getting a OSD as one of the first “upgrades” for your basic FPV setup. They are quite costly but they are well worth it. If you can afford it, get a OSD with GPS. Then you will be able to know your speed, altitude, distance to home, a directional arrow to point you home and some OSDs even have a “return to home” function that flies your plane to where you started from if it looses the RC link. If you plan to fly at high speed near the ground close to your self this is a great way to get a smooth picture. At the moment diversity controllers are quite expensive but hopefully more manufacturers will start making them and the price will drop. With some OSDs you can buy an antenna tracking pod that uses two servos continually point a high gain directional antenna (ex a patch) at the airplane. The antenna tracker uses the GPS data from the OSD and uses that to keep the antenna pointing at the airplane as it flies around. 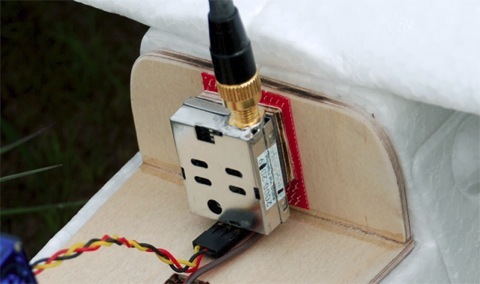 With this setup you can use a much higher gain antenna than you normally could use as it’s able to keep the plane within the narrow beam-width. These are very pricy at the moment and hard to come by. Are available on the 433MHz an 869MHz bands and offer a RC range of up to 50km+. These systems work as “transmitter modules” which mean that they plug into your transmitter and simply transmits on a different frequency that your transmitter normally do. These systems are very expensive but effective. For those of you that want extreme range and have deep pockets. Did you enjoy this guide? Anything you feel is missing? Leave a comment! This entry was posted in Educational, Projects. Bookmark the permalink. Hi David I Have A 5.8ghz 200mw tx /rx FPV system from hobby king…I have a custom built RCHP antennas on both my tx and rx..what can be the expected range if I fly in an open field with almost no obstacles…. Also You mentioned long range systems include the 433mhz one’s….I Dont mean to go off topic but I have a 3DR robotics 433 mhz telemetry kit which I use for my APM board ..how much range will that give me..I am wary of losing my randio range on the telemetry as that will completely render me helpless as I wont be able to track the movements of my copter because it is already beyond visual range,…..
What’s the output power and sensitivity, what antennas are you using and where do you fly (how much noise is in the air? ), those are factors that determine range. It’s difficult to predict as all locations are different. Transmit power up to 20dBm (100mW)…. Great post, really helpful. Thank you! I was very impressed by your FPV Starting Guide. You briefly and clearly discussed what I consider to be all of the key areas, and unlike other bloggers, you gave useful specific information as you went (e.g. actual field of view of the Fatshark RCV922=46deg), which is ALWAYS appreciated in my book. I have already shared the link to your introduction to a friend and I expect to do that a lot in the future. Keep up the good work. As a quadcopter girl, I know that flying an RC Plane takes some extra piloting skills. For example, you cannot “hit the brakes” and hover if get scared or there is something in front of you, not to mention the taking off and landing, which is a totally different story 🙂 But, after reading your article, and this one http://mydronelab.com/best-pick/best-fpv-rc-planes.html the idea of flying a pIane from the cockpit, sounds amazing to be honest, and I might even give this interesting hobby a go 🙂 Thanks!